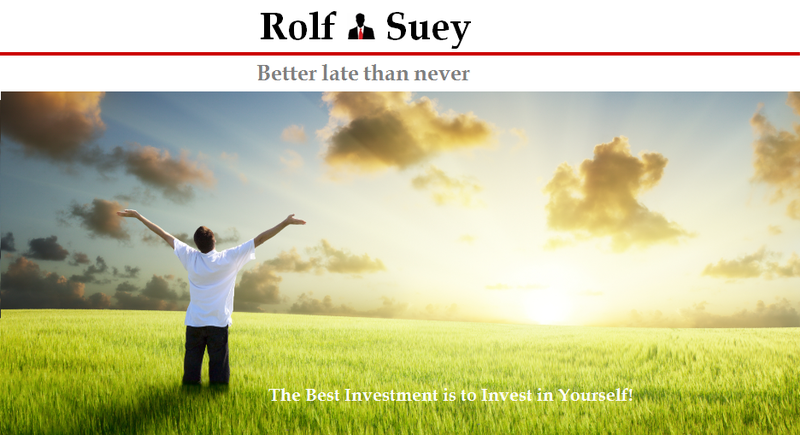 Rolf Suey - Better Late Than Never: Swissco, Double Bagger? Sorry guys, was late on this reporting since I was overseas for the past week. Read an article on Swissco 10 Apr title “Double Bagger, Literally” and decided to blog again on Swissco. Refer to report here. I had own Swissco stocks since end 2010 at S$0.32 and had since sold at S$0.38 early this year, making a meager profit of close to 6.5% p.a. including dividends. 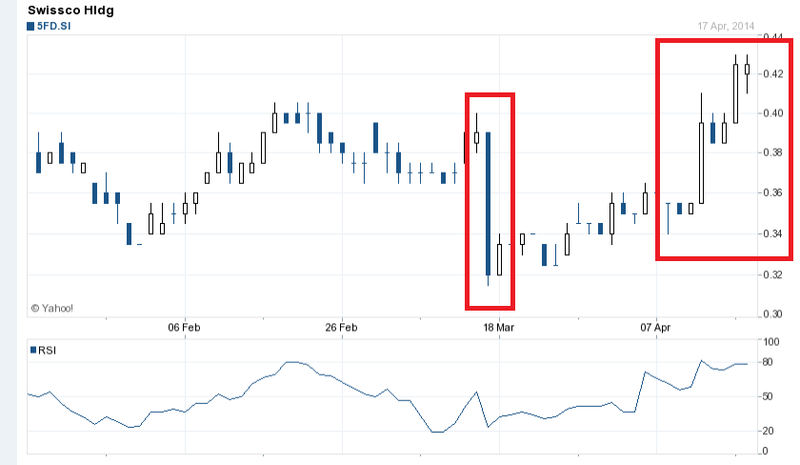 On 17 Mar, its share price tumbled from S$0.39 to S$0.32 and I blogged on a buy again? The fortunate news for me is I accumulated 20 lots at S$0.34. The unfortunate news however is, the accumulation is much lesser than the 50 lots I used to own. Since 8 Apr, price of Swissco had increased more than 25% from S$0.34 to S$0.425. Will it really be a Double Bagger by End 2014 or 2015? The following is the summary of the Analyst report. The analyst expect 10% growth in OSV and no new addition to its service rig fleet at fair value S$0.36 (7x CY15 P/E). Incorporating Scott & English, The range could go up to S$0.59 (10x CY15 P/E) if one new service rig is added in FY15 with six months earnings contribution. After the S&E deal is completed, Swissco will have an enlarged share capital of 670.1m shares and market capitalization of S$422m (from S$160m currently). Kim Seng Holdings’ stake in Swissco will increase from 17% to 73%. The report states Swissco is going to be a mini-Ezion. Seems like this report is 3 weeks late compare to my Blog Post earlier. Refer here. S&E owns and operates a fleet of four service rigs via a 50/50 JV with Ezion, three for Pemex and one for Saudi Aramco). Calculation shows that the fleet of four service rigs generates strong Free Cash Flow to Equity (FCFE) of ~S$14-16m and can be potentially used to fund future fleet expansion. Will not elaborate on this since I had previously already blogged on Tan KS success on KS Energy sale and his influence in Rig segment. PEMEX is state oil company of Mexico. Refer to Clarkson Mar 2014 report, PEMEX is still hunger chase for Service Rigs. Tan KS relationship with PEMEX started more than 10 years back to the highest management, from reliable sources I know. Share placement could be the fastest avenue to grow the service rigs’ business as Swissco’s current net gearing is expected to rise to 0.9x (from 0.6x in FY13) by end-14. Earnings from this division tripled from S$8m in FY11 to S$23m in FY13, thanks to its chartering fleet expansion/renewal and maritime services (build-to-stock vessels’ sale). Swissco has 34 vessels in its fleet currently. It will take delivery of six more vessels by end-2014 and four in 2015. With no new service rigs, our base case scenario of 10% revenue growth from Swissco’s existing OSV business plus the asset injection of existing S&E’s contracts could double Swissco’s net profit to S$46m by FY15. For every US$80m service rig added to its fleet with similar contract terms as its Pemex contract (US$149m over seven years), Swissco’s estimate earnings could grow by S$13m p.a or 28% (on a 100% stake). Incorporating S&E, Swissco = 7.6x CY14 P/E, vs Singapore OSV peers’ ave 10.4x CY14 P/E. It is also trading below its 3-year average of 9x. The 7.6x PE is base on 10 Apr price of S$0.35. Prices had since increase to S$0.425 closing 17 Apr 2014.